Returning to Arcadia for our last show of 2017. This time around we have confirmed one of the most in demand artists in the industry; Mason Maynard. On Friday 22nd December we bring you chapter 002. Our guest artists Mason Maynard has recently been supported by the likes of Green Velvet, Patrick Topping and Solardo just to name a few. We're proud to be the first event in the south east to have him perform an exclusive 2 hour set filled with new productions. 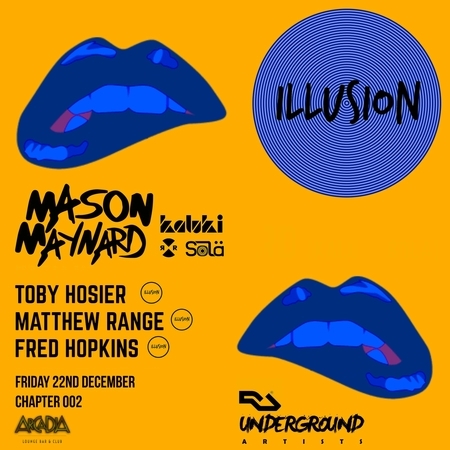 Joining him are local talent and residents of Illusion; Toby Hosier, Mathew Range and Fred Hopkins. We transform Arcadia's Penthouse with a Funktion One sound system making sure the sonics are on point bringing back the true underground feel. As always the vibe is most important. We kindly ask you to put away your phones and enjoy the music. Tickets are now on sale via the link above on resident advisor. They can also be found on Skiddle. Message us here/Instagram/Twitter if you have any questions we will reply quickly.